Situated in the enchanting green landscape of County Clare is this authentic 15th century Gaelic Castle/or tower house. Situated in the enchanting green landscape of County Clare is this authentic 15th century Gaelic Castle/or tower house. The castle is 500 years old and has a perfect mix of medieval aesthetics and modern amenities such as underfloor heating facilitating a holiday which is homely as well as providing participation in a medieval experience. It is a castle with a benevolent and kind personality that enjoys gatherings, which reflects its original use in the 15th Century. The castle accommodates up to 8 guests in 6 bedrooms with Irish linen sheets and pillow cases and authentic woollen blankets from Co. Tipperary to keep warm and cosy. There are three bathrooms floored with Liscannor stone flags and with polished brass sinks. The top floor of the 6-storey castle is the Great Hall, which preserves the grand atmosphere of the Irish Middle Ages. Many of the floors in the Castle are of Liscannor stone, which is a rare, and beautiful hardwearing limestone from close by. The ceilings of the castle contain traces of the hazel branches that were used to hold plaster in the 15th century and are marked with the imprints of branches which make it a lovely decorate feature. The castle has underfloor heating throughout. The thick limestone walls help to keep the heat in the tower. The surrounding Burren limestone provides a similar experience for the cattle that are sent to graze in the winter months. Outside, the bawn or outer wall naturally decorates itself with small ferns and flowers that grow and self-seed in the crevices of the limestone. These include pennywort, lichens and ivy that act as the perfect refuge for small birds. The Castle has a stream closeby that forms a boundary. From on top the view is of several lakes along with breath-taking countryside views of the shelves of sloping limestone of the Clare hills that were deposited by glaciers up to the last ice age 10,000 years ago. The closest beach to the castle is at beautiful Lahinch Beach. This provides a perfect location for surfing on the Atlantic waves and is close to where you can catch a ferry to see the beautiful Aran Islands of the coast of Ireland. The Gaelic Castle contains 6 bedrooms and 3 bathrooms. The castle can comfortably accommodate between 4 and 8 guests. Arriving at the castle you enter into a splendid kitchen and sitting room. The room boast a welcoming fireplace, stone coffee table, well stocked bookshelves and a turf burning stove. There is plenty of good quality local crockery. The fridge freeze, dishwasher and large 6 burning gas ranges for cooking are the 21st century contributions to relaxed rustic living. There is a cloakroom and toilet located on the ground floor. There is large bedroom with a double bed. Each of the six bedrooms has been lovingly furnished retaining plenty of the castle charm, using fabrics in keeping with its late 15th century medieval heyday. Linen sheets and pillowcases and wool blankets from Co Tipperary complete the attractive dressing of the beds. All the furnishings have been carefully selected by experts to reflect late medieval Ireland, a time of hospitality, song and poetry in a Gaelic castle. To this end the best craftsmanship is used throughout the castle to help sympathetically bring it back to life the 500 year old castle. Located just above the bedroom in the original garderobe space is a shower room with WC and sink. From the entrance stone spiral steps lead up to the rooms. At the top of the castle tower is the impressive Great Hall with exposed oak roof trusses. The room is centred around a lovely open fireplace, with large couches and a table for dining. There is a second kitchen with a dishwasher, fridge and electric cooker that serves the Great Hall. Leading off from the other side of the staircase are 4 additional bedrooms. Each located on separate floors in the original bed chamber space. Two bedrooms have double beds and two offer pairs of single beds. 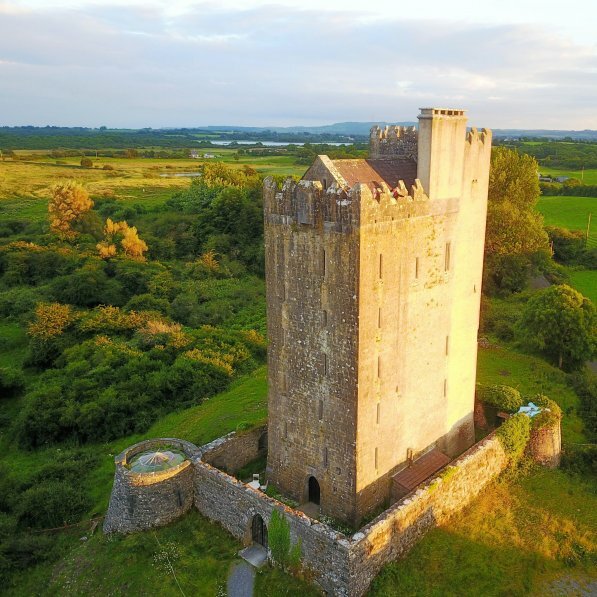 The fifteenth century Gaelic castle of Ballyportry is situated in an area that is rich in heritage, and close to the Wild Atlantic Way. Very few Gaelic castles survive so relatively intact from the late Middle Ages in Ireland. We encourage visitors to explore hills guarded by cairns, court tombs, and wedge tombs of about 5000 years ago, as well as valleys strewn with ring forts and stone cashels, tower houses and roofless medieval churches. The cartographer Tim Robinson made a map of the Burren some years ago showing every field and boundary wall. The stone walls are beautiful in themselves, built with skill to keep animals enclosed. Recently many of the ‘green' roads that were overgrown have been cleared of invasive hazel bushes to make accessible walk ways again. Visitors come to the Burren to walk and appreciate the flowers and the limestone landscape. They enjoy exploring the paths and ‘green' roads in a landscape that is shaped by Atlantic winds and nourished by the warm current of the Gulf Stream as it pushes up the Atlantic coast of Clare. At night the gate of the bawn wall of the castle frames the moon as it rises over the distinctive shelving outline of the Clare hills and nearby Mullaghmore. A ten minute drive in a car will bring you to its slopes and the lovely Gealain lake and a series of walks around on the signed ways, and to the National Park of the Burren. Another drive might be to Cathair Chomain, a stone cliff fort of the early historic period that was in use until about the year 1200 AD. This is about 20 minutes from Ballyportry by car, an expedition that children always enjoy, stick in hand as they climb to the fort through small fertile valleys visited also by grazing cattle. In the Burren the cattle ascend to graze the uplands in winter. The situation of Ballyportry is unique and we hesitate to suggest sports activities. In preference we make the suggestions of trips to look at the archaeology, landscape and views of the Atlantic across to the Aran Islands. There are well known golf links at Lahinch, surfing schools along the coastline of the Atlantic at Fanore and Lahinch. For a full day's outing take a boat trip from Liscannor to look at the wealth of bird life on the famous Cliffs of Moher and on out to the Aran Islands that once formed a kingdom with the Burren. Few Gaelic castles survived intact in the years following the sixteenth/seventeenth wars in Ireland after which the Gaelic aristocracy left for the Continent. Ballyportry castle is the finest and most authentic habitable tower house in the south or west of Ireland, possibly in the whole country. It's builders, the O'Briens held most of the territory of Clare in the fifteenth Century. The Gaelic Castle was one of a series of castles and churches built by the 'Briens, Gaelic aristocrats of the middle ages. In Gaelic Ireland this was a time of culture, intrigue, aristocracy and poetry. The late fifteenth century Gaelic chiefs would have lived lives of privilege, culture, politics and warfare. It was a time of shifting political alliances.